Take fish tacos to the next level with a bright and healthy sour cherry and mango salsa. 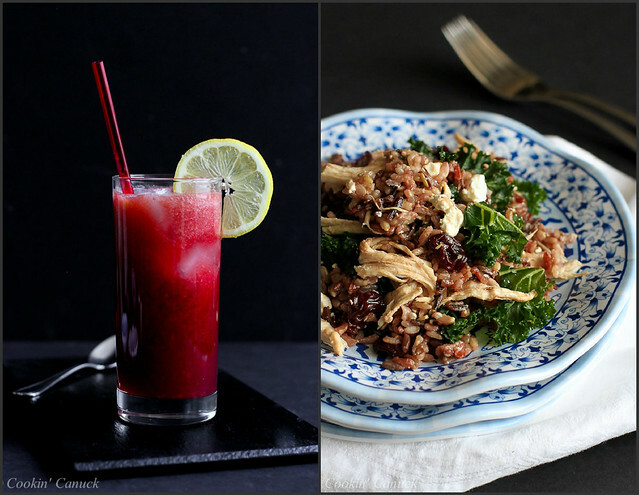 Thank you to the Cherry Marketing Institute for helping me to share this recipe with you. There are times when I’m just not sure how my family is going to react to a new recipe, particularly one that involves an unfamiliar ingredient. It’s not that they haven’t eaten and loved tart cherries in dried or juice form. Heck, we use the dried ones in everything from nut mixes to wild rice salads and drink the tart cherry juice straight, or in smoothies and sparklers every single day, year round! But when my boys saw me pull the bag of frozen tart cherries out of the freezer, they didn’t know what to think. You may know fresh tart cherries as “sour cherries”. 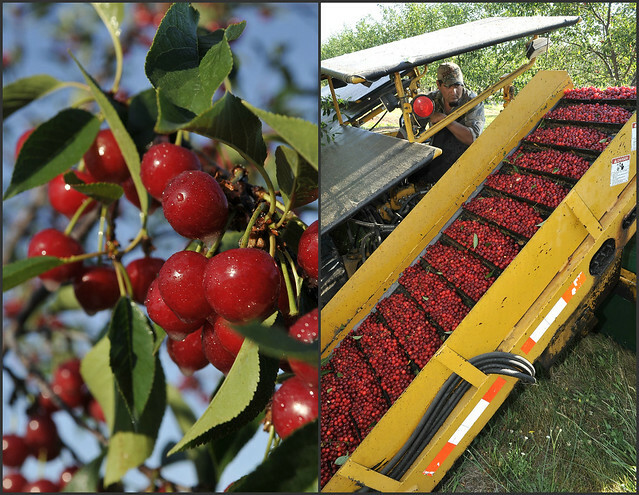 Either way, July is harvest time and the fresh tart cherries are at their finest! I figured it was time to introduce my boys to the amazing flavor of the fresh fruit. If you’ve tasted sour cherries in the past, it’s probably been in a tart, cobbler or preserves. Since we don’t eat a ton of desserts around here, I wanted to highlight the cherries in a savory recipe. There are a couple of fish taco stands that we have fallen in love with, one here in in Utah and one in Ventura, California. If you’re within 50 miles of either of them, make the drive. You won’t be sorry. But I can almost guarantee that you won’t find a tart cherry and mango salsa at either fish taco joint, which is reason enough to make these tacos at home! The salsa is a mixture of tart cherries (I used frozen, defrosted ones, but you could also use fresh or canned tart/sour cherries), mango (see my post on How to: Cut a Mango), lime juice, jalapeno, cilantro and a little agave nectar to sweeten things up. Be sure to allow an extra hour for the salsa to rest so that all of the flavors can meld together. The taco part is as easy as marinating the fish for 15 minutes, baking it in the oven and flaking it into the warm tortillas, with a crumble of queso fresco. They’re fantastic for entertaining, but work just as well as a weeknight meal. So, what did my family think? Well, I was running my kids around to various activities the first time I made these for dinner. Both boys and my husband texted me to say how much they enjoyed them. “The tacos were awesome, Mum! I loved that salsa.” Slam dunk. 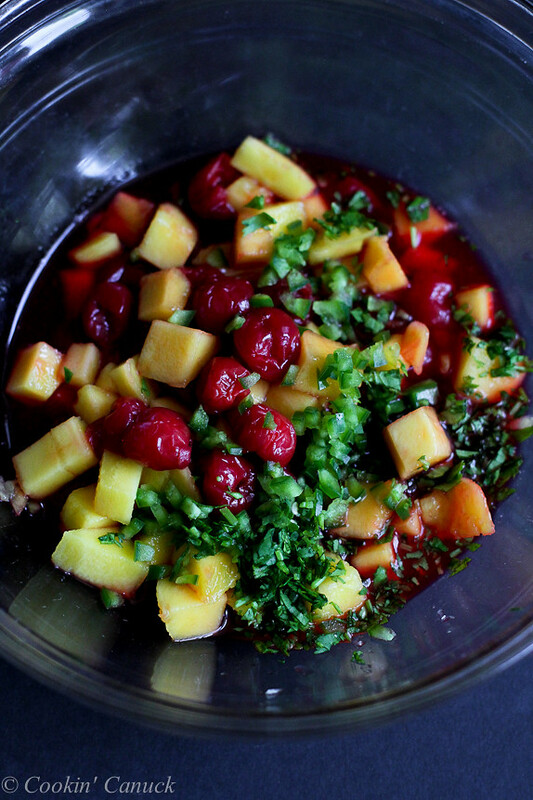 In a medium glass bowl, stir together the tart cherries, mango, lime juice, jalapeno, cilantro, agave nectar and salt. Cover and refrigerate for 1 hour to allow the flavors to combine. Preheat the oven to 400 degrees F. Line a baking sheet with foil and lightly coat with cooking spray. In a glass container, whisk together the olive oil, lime juice, cumin, salt and pepper. Add the fish, turning to coat with the marinade. Let rest for 15 minutes. Transfer the fish to the lined baking sheet. Discard the marinade. Bake until the fish is just cooked through, 8 to 10 minutes, depending on the thickness of the filets. Let the fish rest until it is cool enough to handle, then flake with your fingers or a fork. Heat a nonstick skillet over medium heat. Heat each tortilla until warm, about 10 seconds per side. Divide the fish, salsa and cheese evenly between the tortillas. Serve. * Canned sour cherries can be substituted. **For nutritional information, I used 100 calorie 6-inch flour tortillas. Disclosure: This post was compensated as part of my brand ambassadorship with the Cherry Marketing Institute. All opinions are my own. This post contains links to my Amazon affiliate page. Any revenue made from sales through these links helps to support this blog. Thank you! Oh wow. These have to be the prettiest fish tacos ever. We LOVE cherries over here! Gimme. This is so creative and I love the flavor combo. So bright, fresh and mega- delicious! I haven’t had tart cherries in so long and now I’m craving them! We love cherries at our house!! I don’t think I’ve ever seen fish tacos with a cherry salsa. I’m intrigued, in love, and hungry all at once!!! I love this!! Fruit is totally underutilized in salsas. I mean, mango is one thing, but there are so many other possibilities out there! Definitely have to try this one. This is my kind of summer meal! 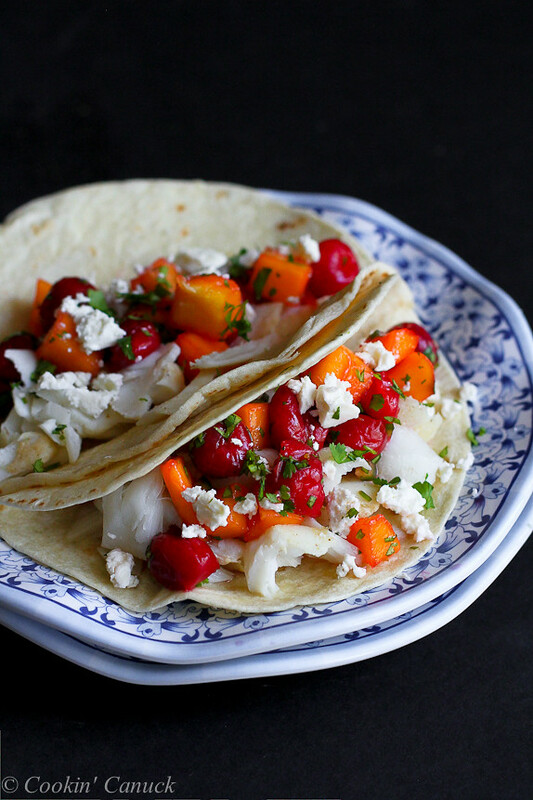 The cherry and mango salsa really makes these tacos something special. These look amazing, Dara! I am hungry for that salsa! I’m not a fan of fish tacos but that salsa may change that! The tacos looks amazing and that salsa? I want to put it on everything!! I love that vibrant fruit salsa! Just beautiful! I have never had sour cherries before but since I am mildly obsessed with cherries, that has to change! I just adore this recipe! Those bites must be a real kicker. Love the sound of these tacos! That salsa sounds amazing! My tart cherry tree is about ready to harvest. Your salsa will definitely be on the menu. We have been waiting forever for tart cherries around here! It seems like they’re really late this year due to the cold weather. Wish I could find frozen ones because these tacos look great! Fish tacos are all I want on hot summer days! I love your version! I can’t stop drooling over that salsa. This is definitely a must-make summer recipe. Pinned. Now that’s a really different salsa for a fish taco and it sounds absolutely wonderful! Love the cherry and mango combo…I bet it transforms any recipe you top it with! Oh my…I’m totally intrigued by this salsa! I love cherries – so it has to be fantastic! I really dig tart cherries. Any cherries really, but tart are just fun to use. Great farm too, I want to dive right into all those cherries. I totally flip over fish tacos but right now…I’m digging the idea of eating that salsa like a salad. Tart cherries are the bomb. I never would’ve thought of putting tart cherries in salsa! Such an interesting way to use them.